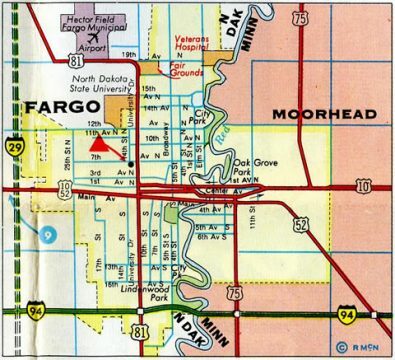 What is left of U.S. 10 in North Dakota travels Main Avenue through both West Fargo and Fargo. The four-lane boulevard shares pavement with Business Loop Interstate 94 to Moorhead, Minnesota. 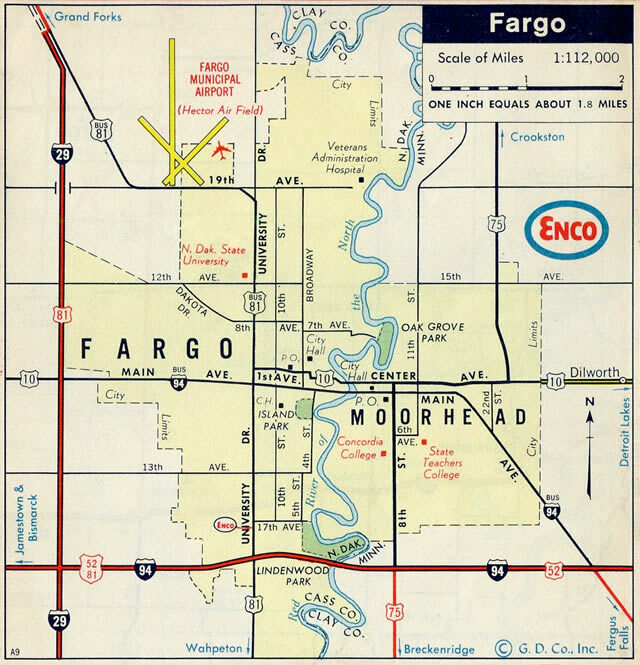 U.S. 10 west of West Fargo was truncated in 1987. 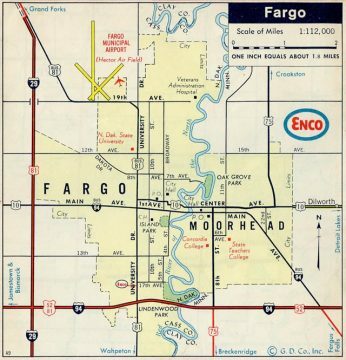 U.S. 10 and U.S. 52 followed separate paths from Moorhead, Minnesota through Downtown Fargo in 1967. U.S. 10 utilized a couplet along Northern Pacific Avenue and Center Avenue east and 1st Avenue North west. U.S. 52 traveled along Main Avenue solo to U.S. 81, where the two combined toward Interstate 29. U.S. 52 was relocated to overlap with Interstate 94 by 1970 as Business Loop I-94 appears. U.S. 10 remained along a combination of 1st Avenue North and Center Avenue, but was no longer split between a couplet. 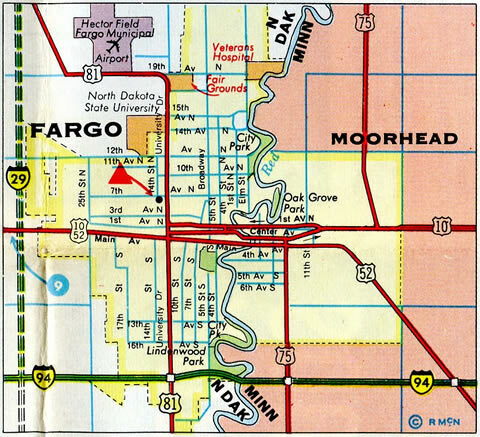 The 1982 North Dakota Official Highway Map shows the current alignment of U.S. 10 turning south from Center Avenue along 8th Street South to connect with Main Avenue west from Moorhead to Fargo. Ramps from Interstate 94 & U.S. 52 (Exit 343) combine to form the eastbound beginning of U.S. 10 and Business Loop Interstate 94 on Main Avenue in West Fargo. 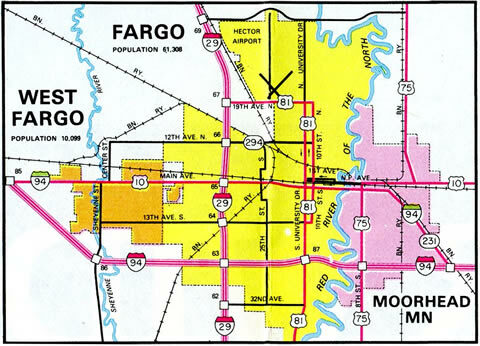 Main Avenue consists of a four-lane arterial throughout all of West Fargo and Fargo. Photo taken 04/22/07. The first U.S. 10 shield coincides with Business Loop Interstate 94 on Main Avenue east in West Fargo. Main Avenue passes by Bonanzaville USA / Red River Fairgrounds on its trek toward Downtown West Fargo and Fargo. U.S. 10 and Business Loop Interstate 94 share pavement along Main Avenue to U.S. 75 in Downtown Moorhead, Minnesota. Photo taken 04/22/07. Reassurance markers posted for Business Loop I-94 & U.S. 10 east after 4th Street East. A number of industrial businesses line the north side of Main Avenue while lodging and food establishments line the south side. Photo taken 06/17/15. 9th Street East heads south from Main Avenue to West Fargo High School and Interstate 94 at Exit 347. The street north leads to rural areas and North Dakota Horse Park. Photo taken 06/17/15. "Second phase of Main Avenue reconstruction complete." West Fargo Pioneer, November 7, 2012. "2016 Construction Open House," online presentation document. City of West Fargo. April 8, 2016.